In the wake of Oliver Stone's JFK, it's almost inevitable that David Ferrie should become for many people a suspect in the assassination of President John F. Kennedy. Joe Pesci's memorable performance as a manic, demented clown has indelibly marked Ferrie as a suspicious character for all posterity. In reality, however, Jim Garrison never produced the slightest evidence that Dave Ferrie participated in the murder of the President that Ferrie actually admired. "You had to see Dave Ferrie to believe him," says a New Orleans newsman, "and once you saw him you could never forget him." Ferrie was 48, completely hairless, and habitually wore glued-on eyebrows and had tufts of hair fastened at random on his head with spirit gum. He had a nasal voice, an antipathy to soap and a penchant for authoritative statements. He also had a long record of failure in a wildly disparate series of endeavors. Ferrie had been a teacher, an unsuccessful candidate for the priesthood, a pilot who had been discharged by Eastern Air Lines for homosexual activity, a "psychologist" with a "degree" from a diploma mill, a private investigator, a self-proclaimed cancer-cure researcher and an amateur hypnotist. In New Orleans he had become enmeshed with a group of anti-Castro Cubans and had been training teams of "guerrilla jungle fighters" for some future assault on Cuba. To muddy things further, some of his acquaintances insisted later that Ferrie often expressed admiration for Fidel Castro. In his spare time, Ferrie labored on a miniature submarine that he was trying to fashion out of an airplane fuel tank. "Like most of Dave's projects," said a friend, "it didn't work." Garrison later was to describe this exotic loser as "one of history's most important individuals." But when Ferrie first surfaced in the Garrison probe on February 18, Ferrie simply identified himself as a reject from the Warren Commission investigation. He had been picked up by Garrison's men shortly after the Dallas tragedy in 1963, Ferrie declared, on a tip from an unstable New Orleans character [Jack Martin]. Ferrie said he gave the FBI a "meticulous accounting" of his movements on the weekend of the assassination. Says a Washington source, "The FBI squeezed Ferrie dry, found nothing there, and discarded him." When Garrison opened his own investigation, three years later, he ran Ferrie through a new interrogation. Said Ferrie, "Supposedly I have been pegged as the getaway pilot." Ferrie denied any role in any plot, denied that he ever knew Lee Oswald and termed Garrison's project "an utter waste of time." Jim Garrison was suspicious of a car trip to Houston that Ferrie made with two friends, beginning some twelve hours after the assassination. The DA had investigated it in 1963 and again in 1967, and, at the DA's instigation, so had the New Orleans Police Department, the Houston police, the FBI, and even the Texas Rangers. They pored over phone records from stops Ferrie made along the way, interviewed witnesses, and grilled Ferrie and the two men with whom he had taken the trip. Investigators have continued to question the same evidence and interview the same witnesses to this day. Nothing has ever come of it. Blackburst also points out that Ferrie had worked nearly every day in November 1963, and took off for some relaxation with his friends immediately after his obligations with the Marcello hearing had passed. Did Dave Ferrie know Oswald? We know he did in 1955, or at least made his acquaintance, when they briefly crossed paths in the Civil Air Patrol. What about later? We have a handful of eyewitness reports from people of highly questionable credibility. Even if Ferrie did know Oswald in 1963, there's no evidence whatsoever that this relationship would have continued past September. That should severely limit Ferrie's potential as a suspect. The greatest injustice of all is that which Jim Garrison committed upon David Ferrie's character. Garrison's claims about Ferrie largely originated with Jack Martin, who began making a series of phone calls the day after the assassination, claiming that Ferrie had some connection to Oswald or the assassination. Kohn also noted that Martin's real name was Suggs, and vaguely recalled his having been "incarcerated in an institution over in Texas" under that name. (19) Kohn's memory served him well. Jerry Shinley has posted two FBI interviews with Jack Martin in full, and I reproduce them here. Note the wide variety of charges Martin speculates about. Note also that in place of evidence of complicity in the assassination, Martin makes allegations about Ferrie's character, as Ferrie's detractors continue to do to this day. Finally, note that Martin omits any mention of a first-hand acquaintance with Lee Harvey Oswald. JACK S. MARTIN, 1311 North Prieur Street, New Orleans, Louisiana, advised that he was listening to a TV program on WWL-TV reporting the life of LEE OSWALD and reporting various interviews with people in New Orleans that were acquainted with LEE OSWALD. MARTIN stated that one of the people interviewed whose name he does not know who he describes as a white male, age early 20's, wearing horn rimmed glasses, recalled that OSWALD had been active in the Civil Air Patrol with DAVID FERRIE. MARTIN stated that when he heard this he "flipped." MARTIN advised that in his occupation as a private investigator he has had occasion to develop considerable information about FERRIE and reported it to RICHARD E. ROBY, Special Agent, Investigative Division, Office of Compliance and Security, Federal Aviation Agency, Washington, D.C., who must have a big file on FERRIE as they conducted a complete investigation of his activities in New Orleans several years ago. MARTIN advised that he called WWL-TV Station and furnished the station with background information about FERRIE, particularly his homosexual tendencies and the fact that he formerly operated the Civil Air Patrol. He also told them that FERRIE was an amateur hypnotist and that it was his idea that FERRIE may have hypnotized LEE OSWALD and planted a post-hypnotic suggestion that he kill the President. MARTIN state that has visited in the home of DAVID FERRIE and he saw a group of photographs of various Civil Air Patrol cadet groups and in this group he is sure he saw several years ago a photograph of LEE OSWALD as a member of one of the classes. He stated he did not recall the group that OSWALD was in or any other details. In addition he stated that FERRIE conducted military type drills with rifles, fatigue clothes and helmet liners of the Civil Air Patrol Cadets and he recalled that FERRIE claimed to have taught these cadets how to shoot. MARTIN stated that he observed in FERRIE's home a number of foreign made firearms and it is his opinion that FERRIE could have taught OSWALD how to purchase a foreign made firearm or possibly have purchased the gun that was shown on television. He advised that he saw similar type weapons at FERRIE's home when he visited there two years ago. MARTIN advised that he has reported this matter to Major TROSCLAIR of the New Orleans Police Department, Intelligence Division, and he felt that Major TROSCLAIR was not giving the matter sufficient concern so he called Assistant District Attorney HERMAN KOHLMAN who was a former newspaper reporter and who was very familiar with the FERRIE case as he had written various feature stories about FERRIE. MARTIN stated that he explained all of his ideas and suspicions to KOHLMAN. JACK S. MARTIN, 1311 North Prieur Street, New Orleans, advised that he has never heard DAVID FERRIE make a statement that President KENNEDY should be killed, or outline a means by which he could be killed. MARTIN stated he had never made a statement to anyone regarding this allegation. He advised that over several years association with FERRIE, he has heard him state the Deputy Sheriffs in Jefferson Parish who had charged him (FERRIE) with a Crime against Nature offense, should be killed. His remarks were made in general conversation several years ago. MARTIN stated he had never repeated these comments to anyone. MARTIN advised he had several phone discussions with HARDY DAVIS, a bail bondsman . 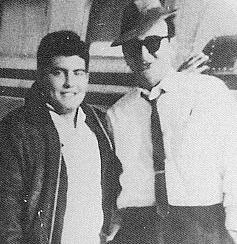 . . regarding a television program which mentioned the possibility that DAVID FERRIE was associated with LEE HARVEY OSWALD in the Civil Air Patrol, and MARTIN and DAVIS may have come to the conclusion the OSWALD had used or carried FERRIE's library card. He advised he had three telephone conversations with Assistant District Attorney HERMAN KOHLMAN, New Orleans, on Saturday, November 23, 1963, in which he told KOHLMAN that FERRIE had guns similar to the type used to kill President KENNEDY that had appeared on television, and further informed KOHLMAN that HARDY DAVIS had told him FERRIE possessed Cuban propaganda literature that he kept in attorney G. WRAY GILL's office in New Orleans, but GILL made FERRIE move it approximately a year ago. MARTIN said DAVIS claimed it was Fair Play for Cuba Committee literature but MARTIN did not believe it, because he knew FERRIE was active with the Cuban Front Group that was anti-Castro. MARTIN stated he is acquainted with the leaders of the anti-Castro group that were in New Orleans before the Bay of Pigs Invasion, and was aware that FERRIE was also involved with this group. MARTIN advised he talked with JERRY PHILIP STEIN to obtain the phone number of KOHLMAN, who had recently married and obtained a new phone number, and that STEIN was the former roommate of KOHLMAN. MARTIN advised he called television station WWL, New Orleans, and told them they should contact Major PRESLEY J. TROSCLAIR of the New Orleans Police Department, who was investigating FERRIE's connection with the shooting of President KENNEDY. He made this call immediately after he had called TROSCLAIR and furnished him with his suspicions regarding FERRIE, based on his personal knowledge of FERRIE and his observation of WWL-TV programs of the background of OSWALD. Note that little of what Martin alleged came from first-hand knowledge. Martin didn't even have first-hand knowledge of Ferrie leaving town on the night following the assassination; he got the information from Hardy Davis. Jack Martin had once worked with Dave Ferrie and held a grudge against him for various offenses that most likely originated in his imagination, like practically everything else he said. He blamed Ferrie for prejudicing Guy Banister against him, when Banister knew Martin very well and was quite capable of mistrusting Martin for plenty of reasons of his own. It is Jack Martin who began the character assassination of Dave Ferrie, which Jim Garrison eagerly picked up and disseminated. Who's pushed the idea of Ferrie as a rabid right-winger, a Kennedy-hater, a potential murderer? Two people first and foremost: Jim Garrison, who got his information almost solely from Jack Martin and discredited witness Perry Raymond Russo; and HSCA chief counsel G. Robert Blakey, who needed a Mob "connection" close to Oswald, to fit his Mafia theory of the assassination. Ferrie, an employee of Carlos Marcello's lawyer, G. Wray Gill, fit the bill. Of all the journalists who were close to the Garrison investigation in its early stage, only Billings maintained a low profile following the release of Oliver Stone's JFK, refraining from the sort of criticism that others like George Lardner and James Phelan renewed upon Garrison. So the two men responsible for bestowing credibility upon the Clinton witnesses were a longtime Garrison loyalist and G. Robert Blakey, who needed a Ferrie-Oswald connection to bolster his Mob-did-it theory. Yet these same two men are rightly criticized by conspiracy theorists and "lone-nutters" alike for distorting the HSCA's work in their Final Report and Blakey's own book on the case. This is just one of many examples of CTs citing a source they would normally avoid like the plague, simply because it suits their agenda -- just as it fit the agendas of G. Robert Blakey, Richard Billings and Jim Garrison to portray David Ferrie as a demented, rabidly anti-Kennedy fanatic. It's time to cut Dave Ferrie loose. We goofed. We believed the ravings of Jack Martin and Perry Russo, the groundless insinuations of Jim Garrison, and the biased claims of Robert Blakey and Richard Billings. There has never been the tiniest shred of evidence against David Ferrie, and we disgrace ourselves by clinging to fantasies about him. David Ferrie was an innocent man. Let him rest in peace. 1. James Phelan, "Rush to Judgment in New Orleans," The Saturday Evening Post, May 6, 1967. 2. Patricia Lambert, False Witness (New York: M. Evans & Co., 1998), pp. 60, 64, 302 fn. 12. Robert Artwohl has posted an analysis of the specific claims made by Garrison in his 1988 memoirs. 3. Gus Russo, Live by the Sword (Baltimore: Bancroft Press, 1998), p. 329. 4. FBI Interview of David Ferrie, November 25, 1963, Warren Commission Document 75, pp. 285-97. When questioned in 1966-67, Ferrie also stated that he and his friends had gone hunting that weekend. This was incorrect, but in the November 25, 1963, interview, he did mention that hunting was one of the activities he and his friends had been considering at the time. He stated that he had not brought weapons with him for two reasons: "he did not know what the hunting seasons were in other states, and he was also concerned about transporting firearms across the state line." 7. FBI Interview of David Ferrie, November 25, 1963, Warren Commission Document 75, pp. 285-97. 8. For more information on Ferrie, see the report written about him by the House Select Committee on Assassinations. 9. A. J. Web site, Nodule 24, p. 10. 10. FBI interview of David Ferrie, November 25, 1963, Warren Commission Document 75, pp. 285-97; Lambert, 44. 11. Jim Garrison, On the Trail of the Assassins, 1991 ed., 32. 12. Richard Billings, investigative notes, undated entry from December 1966 (p. 2). 13. Richard Billings, investigative notes, undated entry from December 1966 (p. 2). 14. Richard Billings, investigative notes, December 29, 1966 (p. 4). 15. Richard Billings, investigative notes, January 25, 1967 (p. 8). 16. Richard Billings, investigative notes, January 25, 1967 (p. 8). 17. HSCA 180-10087-10439, p. 75. 18. HSCA 180-10087-10439, p. 75. 19. HSCA 180-10087-10439, p. 75. 20. FBI 62-109060-4539; A. J. Weberman Web site, Nodule 24, 2. 21. FBI 62-109060-4539; A. J. Weberman Web site, Nodule 24, 2. 22. FBI 62-109060-4539; A. J. Weberman Web site, Nodule 24, 2. 23. FBI 62-109060-4539; A. J. Weberman Web site, Nodule 24, 2. 27. Lambert, 296 fn. 24, citing her personal interview with Pershing Gervais, September 3, 1993. 28. Hugh Exnicios, Lynn Loisel, and Al Beauboeuf, "Conference," twenty-nine-page transcript, March 10, 1967, cited in Lambert, 230, 329 fn. 9. 29. FBI 62-109060-4539; A. J. Weberman Web site, Nodule 24, 2. 30. FBI 62-109060-4539; A. J. Weberman Web site, Nodule 24, 2. 31. Secret Service report, December 13, 1963, Warren Commission Document 87; cited in House Select Committee Hearings, Vol. IX, pp. 105-6. 32. Secret Service report, December 13, 1963, Warren Commission Document 87; cited in House Select Committee Hearings, Vol. IX, pp. 105-6. 33. House Select Committee Hearings Vol. IX, 106; FBI airtel from New Orleans to Director and Dallas office, Nov. 28, 1963, David W. Ferrie file. 34. House Select Committee Hearings Vol. X, p. 130. 35. Anthony Summers, Conspiracy (New York: Paragon House, 1989), p. 489. 37. Peter Dale Scott, Deep Politics and the Death of JFK (California: University of California Press, 1993), p. 247. 38. Scott, p. 247, citing House Select Committee Hearings, Vol. X, p. 130, cf. 110; House Select Committee Final Report, citing House Select Committee Hearings, Vol. X, p. 110; cf. Warren Commission Document 75, p. 293. 40. Orleans Parish Grand Jury testimony of Thomas Edward Beckham, February 15, 1968, pp. 17-8. 42. New Orleans Times-Picayune, February 16, 1968. 43. FBI 62-109060-4539; A. J. Weberman Web site, Nodule 24, 2. 44. Lambert, 23, citing Mercy Hospital records, December 27, 1956. 45. Investigator David Blackburst has posted an analysis of how this widely disseminated story developed from Jack Martin's claims of the assassination weekend. 46. FBI Interview of Jack S. Martin, November 25, 1963; Warren Commission Document 75, pp. 309-11; Jerry Shinley, Newsgroup post of May 13, 2000. 47. FBI Interview of Jack S. Martin, November 27, 1963; CD 75, pp. 217-8; Jerry Shinley, Newsgroup post of May 13, 2000. 49. See my article, Impeaching Clinton. 50. Blakey and Billings also embraced another groundless factoid publicized by Garrison -- the claim that two telephone records linked Dave Ferrie to Oswald's killer, Jack Ruby. 51. Lambert, pp. 46, 55-56, 83, 199-200; Tom Bethell journal, March 14-15, 1968.